Technology Review presents its annual list of 10 technologies that could change the way we live. Each year, Technology Review chooses 10 emerging technologies with the potential to change lives around the world. Some of this year's choices, such as paper-based medical tests and intelligent software that acts as a personal assistant, could reach the market within a year. Others, like biological machines and nanopiezotronics, could take longer but promise fundamental shifts in fields from computing to medicine, communications to manufacturing. The list includes technologies miniature and massive--from fast, cheap, capacious computer memory to batteries that can store enough energy to power a city. All are technologies that we bet will make a huge impact in the years ahead. 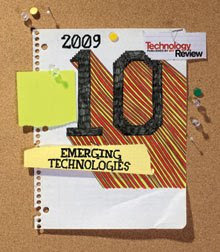 See the 10 Emerging Technologies of 2009. Boek "De kracht van mensen"